We were able to do interviews with Bruce Campbell, Lucy Lawless, Rob Tapert, and more for Ash vs Evil Dead Season 2! Every San Diego Comic-Con offers a different experience and a unique hue to its vintage. Thus it’s impossible to rank one SDCC adventure over another, yet there are moments at each that stand tall. 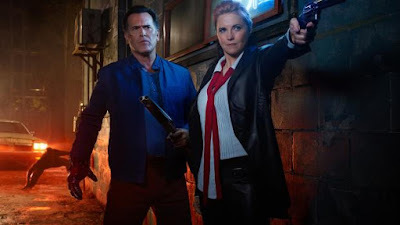 And running into Bruce Campbell and friends on several occasions this past week while they were promoting Ash vs Evil Dead season 2 certainly qualifies as a hard-to-top highlight.